The places written with bold characters in the text show the marked places in the Route-Altitude diagram. During this part of the hike we will climb the Kab-hegy Mountain, which is already visible from the ruins of the old Castle of Vázsonykő. As we descend on its other side, we will visit the ancient carst of Úrkút village and finish this hike at the railway station named Városlőd-Kislőd. We continue the hike along the route of the Blue Trail across the forests of Bakony Mountain. We will take almost the whole distance in the shad of the trees, visit the small Bakonybél town among the mountains and reach at the end of this hike the nice Zirc town. On the last section of the trail in the Bakony we will visit the Gorge of Gaja Brook, later climb onto the plateau of Eastern-Bakony. We leave behind us the forest, the trail leads across wide fields. We meet again with the Gaja Brook and we take the last kilometres in its nice valley. After stamping (the stamp is located on the wall of the ticket office of the castle) we can visit the sights of Nagyvázsony village. Of course, the most well known sight of the settlement is Castle of Vázsonykő. The Vezsenyi family was the owner of this area in the 14th century, they had the core of the castle built. The position of the fort was very important: it could watch the main road leading from Buda towards Italy. Later the Vezsenyi family died out, therefore King Matthias gave this fort to his faithful knight, Pál Kinizsi, as a present. Kinizsi was a very good owner: he extended the castle by adding a palace, a chapel and a defended entrance with barbican in the 1490s. During the Turkish occupation of Hungary, the castle proved to be a stronghold in the network of border fortresses. After the Turkish Ages the residential tower was used for many purposes over the ages: for prison, distillery, and servants quarters. The fortress is currently open for visitors and functions as a museum. Pál Kinizsi had the Szent Mihály monastery built, as well. 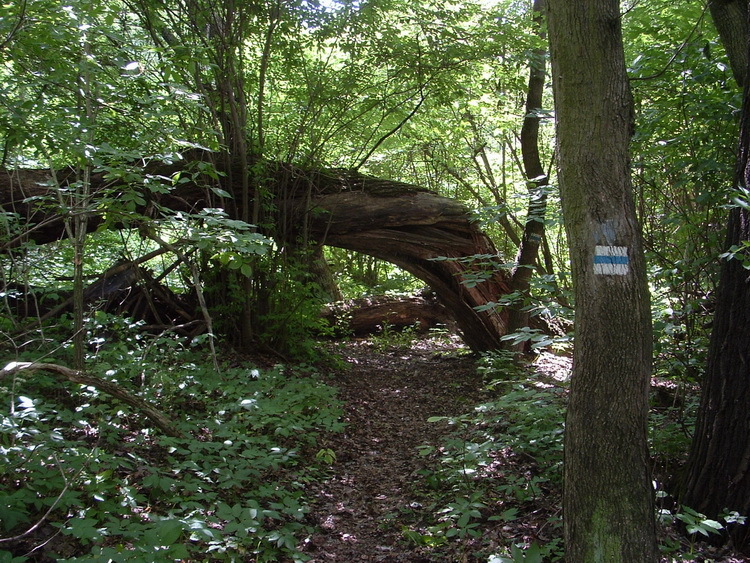 The ruins of the monastery lies in the forest close to the village, and the path of the Blue Trail visits it before it reaches the settlement from west. Pál Kinizsi was buried among the monumental ruins of the former monastery. Unfortunately the landlords of the area demolished the monastery in 1552, after the death of Kinizsi, because they were afraid of the Turkey troops, that they would use that building as a fort beside the village. Other sight is the Post Museum, which we can find in a dwelling house of the settlement, and it shows mainly the Hungarian history of the telephone system, the medieval chapel beside the castle and the Baroque and partly neo-classical Zichy mansion. The mansion works as hotel, it organises horse riding trips in the environs of the settlement. If we continue the hike from the village, we will descend from the ticket office of the fortress (Nagyvázsony, castle) into the shallow valley of the Vázsonyi-séd Brook, cross it at the abandoned building of the former water mill and after a short climb we reach the new part of the settlement. We get to the main road on a narrow asphalt strip leading at the border of the dwelling area. If we turn back here, we will see a nice panorama towards the castle and the old part of the village. The traffic is always huge on the main road leading from Veszprém towards Tapolca, we have to hike on the grassy roadside of the asphalt strip. We turn onto this road, our heading is west and after about 1000 steps we get to a wide, well trodden dirt road leading towards north (Turning away from the asphalt road). We turn onto the dirt road, and after a while pass by the waste water treatment plant of Nagyvázsony. The well-trodden dirt road finishes here, we walk farther on wheel tracks in the same direction. The tracks climb mildly a hillside among bushes and forest patches beside a small valley, later we reach the wide plain at the foot of the Kab-hegy (Kab Mountain). A beautiful panorama opens from the fields towards the regular cone shape of the Kab-hegy, the radio and TV broadcasting towers are good visible on the top of it. The trail crosses the field during a long walk and reach the forest of the Kab-hegy after a 20 minutes long hike. Our wheel tracks lead on a short section at the edge of the forest, later we enter among the trees at the corner of the fields. We continue the hike on dirt roads in the forest and change our direction many times among them. Finally we reach a weedy, neglected clearing in the forest after a quarter hour long walk. The wheel track finishes here, we walk on a narrow, meandering footpath beside the outermost trees at the northeastern edge of the clearing, later the route bends left and crosses the weedy area. After a few minutes long combat in the high weed and nettle we reach another wheel track at the northern edge of the neglected clearing. After about 300-400 steps our way gets to the straight, wide cut-line number 5. The forest of the Kab-hegy is divided onto big squares by straight and narrow cut-lines, they are named with numbers and letters. So we begin the hike on the wheel tracks of cut-line number 5, later we turn right onto the grassy cut-line named “H”. The sides of the big squares of the forest are about 700 metres long, so after about 1000 steps we will reach the cut-line number 6. We turn onto it, and go on towards northeast on its dirt road. This road begin to ascend, first very softly, later the slope becomes more and more steeper. After a while we reach the edge of a big clear-cut at a forest cultivating dirt road. A nice panorama opens in front of us, we can see clearly, that we are standing exactly under the top of the Kab-hegy, and the hard climb will begin only here. We walk on through this huge clear-cut keeping our northwestern direction on the dirt road beside a fence. The top of the mountain with the broadcasting towers stands exactly in front of us. But we don’t climb directly the summit, after a ten minutes long climb we get to a ladder leading through the fence at the left side of the dirt road. The route of the Blue Trail leads through that fence on the mentioned ladder beside the closed gate and continues on the other side. We climb the fence and reach the thinned old oak forest on neglected wheel tracks soon. The mildly ascending road meanders among the trees in the high undergrowth and after a while we get to the other edge of the fenced area. We cross this fence on ladders, similar to the previous one and continue the hike along the dirt road. The climb finishes here, the road keeps its elevation in the mountainside and after a while we reach the lower edge of a newer clear-cut. But this clear-cut isn’t the work of lumbermen, it was made mainly by a big storm, which swooped onto the western side of the mountain in summer 2010. We continue the hard climb at the edge of this clear-cut and reach the fence of the radio broadcasting tower after about ten minutes. We turn left here and follow the fence on a path until the narrow asphalt road leading towards the tower (Kab-hegy Mountain). The Blue Trail turns left on this road and begin to descend from the mountain, but in the opposite direction we can reach the new lookout tower after some hundred steps, if we follow the marks. A beautiful panorama opens from the edge of the flat top of the Kab-hegy in southern direction, we can see the far Nagyvázsony behind the forest and the wide fields. The Balaton Lake appears among the hills and if the weather is clear enough, we can see the far volcanoes of the Basin of Tapolca, as well. We can rest a few minutes on the wooden benches and desks at the feet of the lookout tower and later continue the hike. We walk back onto the narrow asphalt road and descend on it until the hunter’s lodges following the marks, meanwhile the road passes the 300 metres tall TV broadcasting tower. The road leads at the foot of the 300 meter tall TV broadcasting tower. We can find the stamp of the Blue Trail in its metal box on the right side of the road on the wall of a car garage beside the foresters' houses (Kabhegyi forester's lodges). After stamping we hike along the straight, softly descending asphalt road almost until its big left bend, but a few dozen steps before it the marked path of the Blue Trail turns left onto the path of the cut-line number 8. This narrow path meanders among the bushes and after a while we reach again the asphalt road. We turn onto the asphalt strip again, and continue the hike among the trees and clear-cuts on the winding road. We have to watch the right side of the road after about a quarter hour, because we have to find the start of the branching footpath! The path leads at the border of a new plantation and after a few minutes it turns onto the track of the former, liquidated narrow gauge forest cultivating railway line. The track, later increasing embankment leads straight through the forest, we walk on it until a crossing fence. We run down from the high embankment here and go on along a meandering path until a crossing dirt road. We turn onto it and cross the fence on a ladder, because the gate is always closed. The road goes across a new, thick tree plantation and at the farther end of it crosses another fence with gate, but we can find here a second ladder. After the ladder we reach the fields and go on along wheel tracks towards north. After a while we reach Úrkút village at that well, which gave its name to the settlement. Úrkút means “Well of the Lords” and this name refers to that fact, that the landlords of the area watered their horses here, at this well, when they were on hunting. We turn on the main street of the village and reach the centre after a few minutes. The stamp of the Blue Trail is located at the small pub and restaurant named Kék Túra (it means Blue Trail) on the wall beside the door (Úrkút village, stamping place), address: 39 Rákóczi út, Úrkút). After stamping we can hike farther. We turn onto that street, which begins at the pub and climb a small hill. The end of this road is exactly at the gate of the nature conservation area. We enter the area through the gate and reach the former manganese mine of Csárdahegy soon. In the later Jurassic Ages manganese compounds accumulated in the steep valleys of this carst area and in 20s of the previous century this material was excavated here. So the manganese compounds disappear, but the old carst formations of the Jurassic rocks left here. We can descend on steep wooden stairs in the deep valleys and admire the old limestone rocks. There are information boards and a resting place in the centre of this small nature conservation area. We leave the area of the former manganese mine on a narrow path, and reach the border of Úrkút again. The path joins to a dirt road, which passes the houses, crosses a forest patch and gets to the gate of a big, fenced area. It is a huge forest plantation, the 1-2 meter tall trees stand in long rows beyond the fence. We don't cross the fence, the marks lead us on a path beside the western side of the fenced area. When we reach the corner of the long fence, we turn right and after about 200 steps get to a junction of dirt roads. We turn left here and descend in a small gorge, which leads to the wide, grassy Csollányos-völgy (Csollányos Valley). We get to the gravel road leading on the bottom of the valley beside resting benches and desks. We turn on the road, and go farther in northern direction. This road is the remaining of a former, liquidated narrow gauge railway, similar to the other one, whose embankment we have seen before Úrkút village. There was a huge net of similar railways in the Bakony Mountains, unfortunately they worked only until the 70s of the previous century and they were closed because of the uneconomic work of this net. We walk in northern, later in northwestern direction on this wide dirt road on the bottom of the valley, among grassy clearings. We reach the forester’s lodges at the end of the valley after a three-quarter hour long easy hike. the dirt road passes them, later we notice the new building of the Adventure Park named Sobri Jóska on the left side of the road. The road passes the big car park of the adventure park, gets an asphalt surface, and after a while it crosses the Torna-patak (Torna Creek) and the railway line through a tunnel. We climb onto the asphalt road leading towards Városlőd and turn right in the junction. The Blue Trail reaches the railway station on this slowly descending asphalt road. The metal box of the Blue Trail's stamp is located on the wall of the building beside the door of the office (Városlőd-Kislőd railway station). Another stamp is located in the village in the Fenyves kocsma Pub, on the route of the trail. We reach the first houses of Városlőd after a ten minutes long walk on the asphalt road. We notice the wooden sculptures of the deported Swabian population of the settlement beside the road, later we reach the Roman Catholic church on the Fő tér. The church was built partly from the stones of a destroyed monastery in the 17th century. If we walk farther, a small chapel appears on the left side of the street, at the corner of a dwelling house. It is consecrated to St. Florian, to the patron saint of the firemen. It was built in 1822, after a big fire, when the whole settlement burnt down. After a few dozen steps we reach the old houses of the former Swabian population of the village. The big houses stand mainly on the left side of the road. We can find a small museum about the history of the settlement in one of them. After a while we get to a junction and turn right. The Fenyves kocsma Pub stands at the corner of the streets. We can find a Blue Trail's stamp in the pub, its box is equipped on the wall at the bar (Városlőd village, stamping place). The marked trail crosses the Torna-patak Brook and the railway line again, finally we turn onto the Hölgykő utca (Hölgykő Street), a street leading towards north. We cross the main road number 8 through a tunnel at the border of the village and our road connects to the asphalt road leading to Csehbánya village. We walk on along this narrow asphalt strip until the bridge above the railway line. We cross the railway third times, and after the bridge a dirt road branches off towards left from the road, the Blue Trail turns on it. Another wheel track begins on the other side of the road, it leads to the ruined fort of Hölgykő vára (Path to the ruined Castle of Hölgykő). We can reach the modest ruins in 20 minutes, if we follow the painted marks. Our dirt road descends into a small valley, crosses a brook, goes across a weedy, swampy field and after a few minutes we turn right, on a branching path. The path runs meanderingly in the high weed and nettle among the rarefied trees, we cross this forest patch and reach a long, grassy pasture climbing onto a hill. Some parts of this area are often fenced with electric wires, we can open and close them with the isolated hooks. The path finishes here, we begin the climb across the grassy field. We have to look for the marks of the trail on the columns of a middle voltage power line. We ascend slowly on this long pasture, later wheel tracks turn on this field from left, and we walk farther on them beside the edge of the forest. We get to the highest point on the hillside, if we turn back here, we will see the houses of Városlőd village in the far valley. We follow the columns of the power line at the left edge of the fields, beside the forest, later we reach that point, where the trail turns left onto a dirt road leading into the wood. 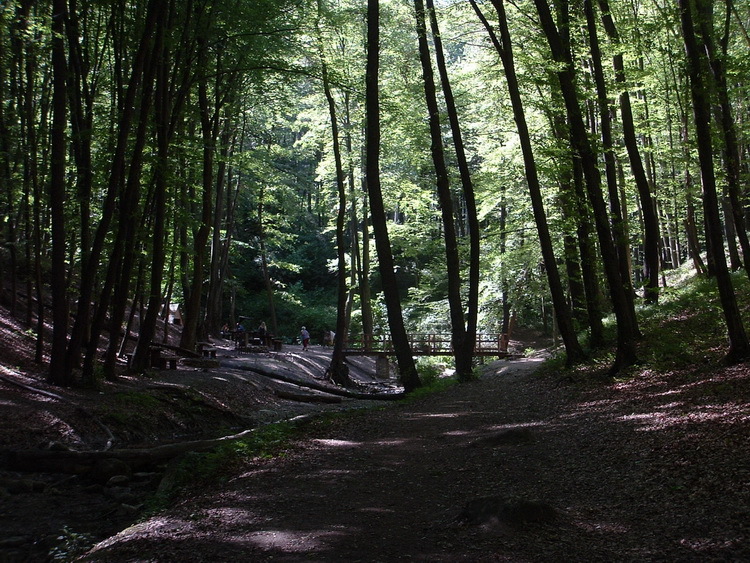 The road descends among the beech trees into the valley of the Torna-patak Brook. We turn off from the dirt road, cross the brook at a wooden pedestrian bridge and go farther along a narrow path on the other side of the brook. This meandering footpath leads at the bottom of the valley beside the creek, we have to make detours because of the fallen trees, which lie as barriers on the path. There is a deep silence in the valley, we can hear only the noise of the babbling brook. It is a very nice section of the hike, unfortunately it finishes after an about ten minutes long walk. The path crosses a weedy meadow, and climbs up on the embankment of the former narrow gauge railway (Embankment of the former railway). We continue our hike on the winding embankment, now a dirt road runs here instead of the rails. It is a very easy section of the today’s hike, the road ascends only very mildly in the valley of the Vámos-patak (Vámos Brook) towards the far ridge of the hills. We reach the wooden benches and desks of a resting place after a three-quarter hour long walk in the forest. We cross a busy, well trodden, wide dirt road on the ridge here (Bauxit transport road). Big trucks carrying stones or logs use this road towards the railway stations or factories. Why is it better instead of the former forest railway? Nobody knows! After the wide ridge the marks leave the dirt road and turn onto a path, which descends in the valley of a small, nameless brook towards north. It is a nice part of our hike, as well. The path crosses many times the meandering brook at the bottom of the shady valley. We reach the fence of the lonely standing forester’s lodge after a half an hour. We follow the long fence on the path and after its corner the footpath turns right and joins into the gravel dirt road across a weedy field. The Blue Trail leaves this road after about one and a half kilometer (Németbánya village, road to the stamping place), but we have to visit the small Németbánya village on this road, if we want to stamp into our Blue Trail booklet. The box of the stamp is located on a post at the wooden greeting board at the border of the village. After the stamping procedure we go back to the Blue Trail, and turn onto a path from the well trodden dirt road. This path climbs steeply in the side of Szállás-tető Hill, later we turn onto wheel tracks. The tracks lead into a narrow asphalt strip, we continue the hike on this narrow asphalt strip. After some hundred steps we leave this road, cross a small meadow of a valley and reach another narrow asphalt road (Asphalt road to Bakonybél). We turn on this road, it will leads us until the far Bakonybél village. First the road meanders in the forest among the hills, but later, after a three-quarter hour long walk, it begins to descend into the valley of Bakonybél. We leave the forest for a little while, a very good panorama opens from the meadow towards Bakonybél lying in the bottom of the small basin. We reach the border of the villages after a few minutes, the building of the Gerence guesthouse appears on the right side, beneath the road. We walk farther, till the branching of the access road of the guesthouse, turn onto it, and visit the building (Bakonybél village, Gerence guesthouse). The stamp of the Blue Trail is located on the terrace at the door of the house. We can find another stamp in the Vadszőlő Restaurant in the village (address: 45 Fürdő utca, Bakonybél). After stamping we go back onto the route of the Blue Trail, which crosses the wide Gerence-patak (Gerence Stream) on a wooden bridge. The path goes across a weedy field and after a forest patch reaches the first houses of Bakonybél at the Fürdő utca (Fürdő Street). Bakonybél is perhaps the most isolated settlement among the mountains of Bakony. Wintertime, if the snow is enough big, the village isn’t accessible for long days from other settlements. The village has an old monastery, it was founded in 1018 by Szent István, the first Hungarian King. His priest educator, Gellért bishop lived here between 1023 and 1030. The building of the monastery was destroyed in the Turkey Ages, but it was renovated in the 18th century. Today the settlement is the centre of the tourism in the Bakony Mountains, there are a lot of different accommodations from the cheapest until the most expensive hotels. The Blue Trail turns left from the Fürdő utca (Fürdő Street) onto the Ady Endre utca (Ady Endre Street), and crosses the Pápai út (Pápai Road), the main road of the village. We continue the walk on the other side of the Pápai út, on a narrow asphalt strip leading among the hills. The Blue Trail leaves the last houses of Bakonybél at a metal barriere and the road turns into the valley of the Öreg-séd Brook. We walk on this meandering, narrow asphalt road more than two kilometers, after that we turn left onto a dirt road (Getting off from the asphalt road). After a few steps we leave this dirt road and continue the hike on a narrow path. We begin the climb leading to the top of Kőris-hegy Mountain on this path, our way ascend steeply across an old, neglected clear-cut in the mountainside. There are only thick, stinging bushes on the place of the former forest, the new forest begin to grow up in these years. We reach the old trees after a quarter hour long hard climb. The ascend finishes here for a few minutes, and we turn onto a wide forest cultivating dirt road. Later the Blue Trail cuts off the hairpin bends of the forestry road on paths, but finally joins to dirt road. At the end of the climb we reach a wide plateau in the side of the mountain. The dirt road crosses the narrow asphalt strip leading towards the summit, and goes farther in the forest. Later we turn on a path, the climb begins again, and a after a few minutes long walk this path joins to the meandering asphalt strip. We reach the military locator station of the Kőris-hegy after the hairpin bends of the asphalt road. Lookout tower on the top of Kőris Mountain. We were here three times, but the weather was always misty. We don't have good luck with the Bakony! The real summit is close to this locator station, we reach it on a small, rocky path (Kőris-hegy Mountain). A wooden lookout tower stands on the top of the mountain, the box of the Blue Trail's stamp is equipped on the pillar of the tower. A nice panorama opens from the top terrace towards the surroundings of the Kőris-hegy. There is a small resting place at the foot of the tower with desks and benches, we can rest here some minutes, because we have climbed the highest mountain of the Bakony: the Kőris-hegy is 709 meter tall! After the summit begins a long, but comfortable slope through the beech forest and a big clear-cut until the former Kisszépalmapuszta Homestead. The uninhabited, abandoned buildings of the homestead were demolished in the past few years, only the name of the clearing cherish its memory. The Blue Trail goes on along a narrow asphalt road beside a long fence, at the corner of the fence we turn down from the road and walk beside the fenced area on a narrow path. Later we turn onto a dirt road and after a little while leave the forest. The trail crosses a field and joins to the gravel road leading to Szépalma Homestead (Hotel Szépalmapuszta, access road). A hotel and congress centre work in the buildings of the former homestead, the trail avoid them, we hike on along the narrow asphalt access road of the homestead. 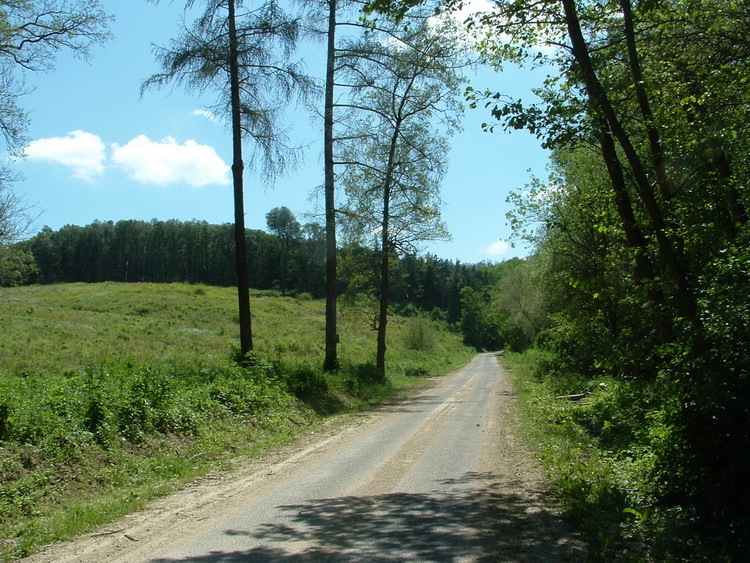 The road runs across a forest patch, later it leads at the border of the forest and fields. The marks lead us on a longer section among the outermost trees of the forest, parallel with the aphalt strip. After a 20 minutes long walk we get to the junction of roads, we turn right here onto a worn, potholed asphalt strip and climb a small hill. If we turn back on the top of this hill, at the tower of a mobile phone relay station, we can see the Köris-hegy already in the far. If we walk on, the tower of the church of Borzavár village will appear exactly in front of us. First we will see only the cross of the church, later will appear the tower above the weedy field. The road bends towards left, we leave this worn asphalt strip there and turn onto a narrow descending path towards the village. We reach the main street of Borzavár beside the already mentioned church. We walk along the Fő utca (Main Street) and get to the Oázis pub (Borzavár village, stamping place), address: 18 Fő út, Borzavár) on that place, where the street begins to descend steeply onto the valley of the Borzavári-ér (Borzavári Brook). We find the stamp of the Blue Trail in its metal box on the terrace of the pub. Another stamp is located in the Mayor's office of the village (address: 43 Fő út, Borzavár). There is a third stamp on the fence beside the food shop of the village (address: 33 Fő út, Borzavár). After the stamping procedure we descend on the asphalt road into the valley of the brook, cross it on a small bridge and leave the road. We walk along a narrow path which leads us first beside the asphalt road on a grassy field, later climbs the stony, bushy hillside almost parallel with the road. After a while we reach the forest and turn onto a dirt road. This road ascends on the side of the Pintér-hegy (Pintér Hill), crosses a small valley on the long ridge of the hill, finally after a longer climb and a comfortable walk in the forest descends to the border of Zirc. We reach the inhabited area of the town through the wooden gate of the Pintér-hegyi Parkerdő (Park Forest of Pintér Hill). The Blue Trail descends into the centre of the town on the long and straight Deák Ferenc utca (Deák Ferenc Street), while we can admire the panorama of Zirc with the towers of the church of the monastery. 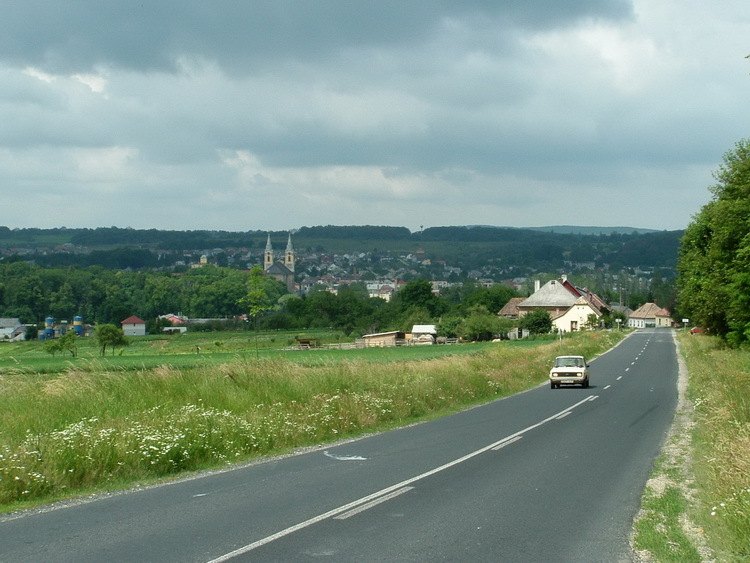 We reach the centre of the settlement in a quarter hour and turn onto the wide and straight Köztársaság út (Köztársaság Road), which leads towards the railway station of the town. We can reach the building of the station on its short access road beside the Tesco hipermarket (Zirc, railway crossing). We can stamp into our Blue Trail booklet at the station. The box of the stamp is equipped on the wall of the building in front of the platforms. Zirc is well known about its monastery in Hungary. It was founded in 1182 for Cistercian monks. At the beginning of the Turkey occupation the monks escaped from the monastery together with the population of the village. Later, after the Turkey Age German Cistercian monks arrived to Zirc from Heinrichau and the village was populated with German farmers, as well. They didn’t repair the ruined monastery and church, but they built a new one from the stones of the old buildings. Only one column of the old church stands beside the busy Köztársaság út as a memorial with a Prince Szent Imre sculpture on the top of it. Zirc is the centre of the Hungarian Cistercians since 1814. The library of the monastery is a special treasure, it is accessible with expert leader. It is worth to visit the Arboretum beside the monastery, its high stone fence stands beside the Köztársaság út, and one of its gates is located at the corner of the wall, close to the railway crossing. After stamping we go back from the railway station onto the Köztársaság út, cross the railway and begin the climb towards the hills beside the road on the sidewalk. After ten minutes we leave the last houses of the settlement, if we turn back here, we can see the whole town beneath our feet in the wide valley. The uphill walk continues, we must go on the grassy roadside because of the traffic, later the road turns among the hills and the panorama disappears. We reach slowly the wide plateau, and notice the houses of Nagyesztergár village in front of us. After a few minutes we reach the first houses of the settlement, we continue our hike along the right side pavement beside the road (Nagyesztergár village). After a short walk we get to the branching Erdei Ferenc utca (Erdei Ferenc Street) and following the marks turn onto it (Nagyesztergár, letérés a főutcáról). After a while we reach the end of the road and the border of the settlement. The continuation of the street is a dirt road leading in the forest, we follow it and step among the trees. This road descends slowly into a valley and we cross a small brook at the bottom of it. The dirt road leads beside the creek, after about twenty minutes ruined buildings appear in front of us. We get to the abandoned houses of the former Veimpuszta homestead homestead. The dirt road branches into two directions in front of the houses, we follow the signs and turn left here. We reach a crossing dirt road after a few hundred steps, turn onto it and descend in a wide valley. The road crosses a small brook on the bottom of the valley, but we have turn off from this road before the bridge. Narrow, neglected wheel tracks begin in the the valley, we have to find the start of it! If we turn onto the wheel tracks, we will reach a wide, swampy area on the bottom of the wide but shallow valley. These tracks meander in the high undergrowth, but they keep the southeaster heading. Here is the origin of the Gaja-patak (Gaja Stream) which will follow our way among the hills of the Eastern Bakony. The field is covered by high weed and reed, the winding wheel tracks try to find the driest places in the valley. We can see the marks very rarely on the lonely standing trees beside the tracks. After about one kilometer long walk the wheel tracks turn right into the forest and they begin to climb in the side of the valley. Don’t follow them, there is a small path, which starts among the first trees towards left! We have to turn onto this neglected track and follow the winding footpath among the fallen trees. After a little while the path crosses a small brook, and begins to climb on the hillside. We get to an old fence, the painted marks are on the columns of it. Finally we reach a weedy field, a dirt road arrives here from right, we turn left onto it and walk on. The dirt road goes around the Cser-hát Hill and reaches the small access road of Bakonynána village after a twenty minutes long walk. We turn onto the narrow asphalt strip and follow it in northeastern direction. It crosses the Gaja-patak on a bridge and gets to the border of Bakonynána soon. The signs turn right at the branching of asphalt roads, but we have to stamp into our Blue Trail booklet here! We will find the metal box of the Blue Trail's stamp on the wooden lamp post standing at the junction (Bakonynána village, stamping place). Beside the lamp post stands a blue public water tap, we can fill up our bottles here. .
After stamping we have to turn right onto the branching asphalt road, but we go only a few steps on it, because we turn left into a gravel car park. A gravel promenade starts here at the farther end of the car park, we have to follow it through the fields. We will reach the buildings of the Prém-malom (Prém water mill) on it. The Blue Trail avoids the buildings, it turns onto a path, cross a narrow brook and after an old clear-cut reaches the forest. The winding path, or rather narrow, well trodden promenade runs in the side of a valley, we can hear only the babbling sound of the Gaja Brook from the bottom, but we don’t see the brook because of the high undergrowth. After about a twenty minutes long walk our promenade descends to the Gaja Brook and we reach a resting place (Gaja-szurdok Valley, resting place). Wooden benches, desks, fire places are located on the coast of the stream, we can access them through a small bridge over the Gaja. The path of the Blue Trail begins to climb out from the narrow valley here, but it is worth taking a short detour from this resting place to the Római-fürdő (Roman Bath) on the marked path following the the Gaja. If we walk a few hundred steps on the coast of the Gaja, we will reach a narrow rock gorge, the water fall into the deep, rocky valley with small cataracts. This place is named as “Roman Bath”, but it was never bath, especially not a Roman one! If we walk back to the resting place, we can continue our walk on the Blue Trail. The path climbs out very steeply from the valley of the Gaja and we reach soon the ridge of the hill. The footpath flips on the sharp ridge and descends back into the valley of the brook on the other side of the hill! Actually we cut down a big bend of the Gaja. We continue our hike beside the Gaja, leave the narrow valley, and get to the fields. We walk on a wide, well trodden dirt road here, but after a little while we leave it and cross the Gaja at its ford. We continue the hike on the other side of the stream through the wide, grassy fields, pass the building of the former Vadalmás Water mill, finally reach the fenced area of the Szent-kút (Sankt Well) and the Calvary (Szentkút Chapel). The benches of the outdoor worship are a calm and shady resting place especially in summertime. If we walk on, the houses of Jásd village will appear soon in front of us. We cross the Gaja on a bridge (we are on its left side again), the dirt road leads towards the village (Jásd village, stamping place). We find the stamp of the Blue Trail on the fence beside the grocery of the village (address: 31 Dózsa György út, Jásd). Another stamp is located at the fence of the pub (49 Kossuth utca, Jásd). After the stamping procedure we continue the hike along the Kossuth Lajos utca (Kossuth Lajos Street) and after its bend we turn right onto the small Patak utca (Patak Street). After a few steps the street turns left, but we go on straight and reach the Gaja Stream again. We cross it on a wooden pedestrian bridge, and a long climb begins onto the Tési-fennsík (Plateau of Tés). Our steeply ascending path enters the forest, and we hike farther among the trees. The path of the Blue Trail changes paths and dirt roads many times, we have to watch the painted signs on the trees, but we walk always uphill! We will reach the plateau and Tés village after a three-quarter hour long exhausting climb (Tés village, main road) in the beech forest and among clear-cuts in different ages. If we have enough time, we can take a short detour on the red “T” marked path to the lookout tower named Széchenyi Zsigmond from the Blue Trail. This trail branches off and joins back later into the marked path. There is a nice view from the lookout tower towards the valley of Jásd and the surrounding hills. The Blue Trail turns left on the main street of Tés and leave the settlement soon, but it is worth visiting the wind mills of the village! The mills are located in the other direction and they are accessible through the yard of a family house. The address of the house is 20 Táncsics Mihály utca. We can visit an old blacksmith workshop in the yard of the mentioned house, too. The two mills stand behind the houses on the wide plateau. They used the almost permanent western wind, which can blows freely on the bare plateau of Bakony Mountains. We leave Tés village on its straight main street and continue the walk on the access road of the village. We reach the houses of Csőszpuszta Homestead at the right-angled curve of the road. The Blue Trail runs straight on a path, where the road turns right and we will notice the houses of the right side of the footpath. Unfortunately we cannot cross the fence beside the path, so we have to go farther, until the crossing asphalt road. We can turn right only here, and walk back to the homestead. We will find the speleologist basis named Alba Regia among the houses of the homestead (Csőszpuszta homestead, stamping place). The metal box of the Blue Trail's stamp is equipped on the wall beside the door of the house. After stamping we go back to the path, cross the asphalt road and continue the hike along a well trodden dirt road which begins at the other side of the road. View from the edge of a clear cut. We can see the Vértes Mountains in the distance. This dirt road leads at the edge of the fields, later we enter the big cear-cuts. We cross this bare area, step in the forest again and get to the former forester’s lodge Hamuház forester's lodge after a three quarter hour long walk. There are resting benches and desks beside the house. After the lodge we cut a bend of the road on a path, later walk along the well trodden dirt road again. After a while we leave this road and turn left onto a path. We begin to descend from the plateau on this path beside a trench named Tűzköves-árok and reach the edge of the forest at a huge clear-cut. We cross the bushy area on a descending, winding path, touch the hairpin bend of a forestcultivating road, and reach the open-air chapel (Outdoor sanctuary) already in the forest at the bottom of the valley. We turn onto a narrow asphalt road here, which leads towards north. We will get to the buildings of the Kisgyóni Természetbarát Telep (Kisgyón, Naturfriend's Resort) on this road after a thirty minutes long walk. The marks turn right at the edge of the settlement, but if we want to stamp into our booklets, we must go farther on the asphalt road. We can find the Blue Trail's stamp in its metal box at the gate of the first building's yard on the right side of the road (Kisgyón, Természetbarát Telep). There is another stamp on the side of a Blue Trail's information board. After stamping we climb back onto the plateau of the Bakony. Our dirt road ascends in the forest among clear-cuts until the ridge of the Dóra-hegy (Dóra Hill) and we continue our hike on the long, wide ridge of the hill. After a three-quarter hour long walk in the forest we reach the wide fields of the plateau. Our dirt road leads for a while on the edge of the grassy meadows and the forest, a good panorama opens towards north through the fields. Later, at the corner of the forest we get to a crossing dirt road, we turn on it and continue our hike towards south-east. A high voltage power line crosses our way, later we enter the forest again and walk across it. At the farther side of the forest we reach the fields again, our heading is still south-eastern. Our route bends right in the branching of dirt roads, the marked trail crosses the power line again and reaches another dirt road at the edge of the forest. We turn left here, our heading is southeastern again. After about a kilometer a wheel track crosses our route, the marks arrive on it. We turn right here and enter the pine forest. Our path meanders among the pine trees, later it turns towards south-east. If we see through the branches of the pine trees, we can notice, that our path goes on the edge of a long and deep valley. It is the Burok-völgy Valley, a more than ten kilometre long rift valley through the plateau of Bakony. Our path meanders on the edge of the rift valley for two kilometres, after that the path of the marks branches off and descends steeply into the valley, but the Blue Trail stays on the plateau. We turn onto a dirt road on a grassy, bushy clearing and leave the forest. We reach the fields and meet with the already mentioned power line again. Our dirt road descends mildly among cultivated areas until the small Bakonykúti village. We reach the centre of the village on the wide Szabadság utca (Szabadság Street) among carved wooden sculptures. The box of the Blue Trail's stamp is located on a wooden post beside the bus turning place, in front of the Mayor's office (Bakonykúti village, bus turning place). After stamping we leave Bakonykúti soon, cross a small brook at the border of the village and our path begins to climb back onto the hills. Attention! This section of the Blue Trail needs experience in the orientation and in the searching of the painted marks! The trail will go on hardly visible paths and wheel tracks, changes its direction often among them! Don't forget, this is a rarely used military trainig area, the vehicles have made a lot of meandering wheel tracks in different headings! I try to write the following section more detailed, but the mentioned tracks can change often. After a forest patch we reach the grassy fields again and the houses of Bakonykúti-puszta Homestead appear in front of us in the far. After a while our wheel tracks turn right into a valley and descend to the bottom of it. The road bends left here, towards the houses of the homestead, but we have to find that small path in front of us, which enter the forest (Bakonykúti-puszta farmstead). The meandering path passes a ruined house in the high undergrowth, later we get to wheel tracks, and the climb continues onto the hill. These tracks join into a meandering dirt road, we reach the top of the hill on it. We pass a small quarry on the right side, and get to a small clearing. We walk at the eastern edge of this clearing, and have to look for that narrow path, where we leave this area! Our path enters the forest and descends into a small valley. After a few hundred steps we get to the edge of the forest, we leave the trees, and turn right onto wheel tracks. The tracks run in northeastern direction, beside a bushy row, we can see the wide, cultivated area among their branches. We take about 500-600 steps on this road, the line of bushes finishes, and we have to keep the heading in the branchings of roads. After a little while we pass a quarry on the left side, and our tracks turn slowly right. Now our heading is southeastern, the wheel tracks lead beside the trees, but after 200-300 steps we have to turn left, among the trees at the branching of paths. We cross the forest patch, and get to another wheel tracks. We follow them in northeastern direction and reach their narrow hairpin turn soon. We go on straight, enter the forest on a path. We pass resting benches and desks, later our path turns right, into a narrow cut-line, finally we reach the bend of a narrow asphalt road. This road comes from right and turns towards east, but we turn left here, onto a dirt road and we reach the asphalt road leading towards Gúttamási village after five minutes (Asphalt road crossing). Here we reach the edge of the military area, and the orientation will be easier again! We walk only 200 steps on the road in southeastern direction and leave it on the small access road of a stone quarry. We walk in the forest again, change the direction many times among the different dirt roads and wheel tracks in the chessboardlike forest, finally after an hour we get to the coast of the Fehérvárcsurgói-víztározó (Reservoir of Fehérvárcsurgó). We walk close to its coast on a small asphalt road, later we turn off at the dam of the reservoir. A very nice view opens towards the lake from the dam, we walk along it, and climb the side of a hill on a narrow path. We are only in some meter height above the lake, but we can see its whole environs from this place. Later we descend back, walk around this small hill and reach the first weekend houses of Fehérvércsurgó village. We can find the Becsali kocsma Pub among them beside the road. The metal box of the Blue Trail's stamp is located on the wall of the pub (Fehérvárcsurgó, Becsali Pub). We stamp into our booklet and walk on. We walk around the southern, tussocky bay of the water reservoir on the road, later turn onto its embankment and reach Fehérvércsurgó village in a half an hour. We go along its streets following the marks and climb a hill on the northern side of the lake among small weekend houses and gardens. Our road reaches a junction of dirt road at the corner of the forest, we turn right here, onto the joining road and after a few steps reach the wooden gate of the Gaja-völgyi Tájcentrum (Nature Conservation Area of Gaja Valley). We cross it, walk some steps back to the corner of the forest and turn right onto cart tracks. After a little while the traks reach the bushy area of a former clear-cut, the Blue Trail gets around it with a left curve, later we reach a junction of dirt road on the ridge of a hill. We turn left here, cross a narrow forest belt and descend into a valley through the clear-cut of the other hillside. After a few minutes we reach the forest at the lower edge of the clear-cut, we have to look for the branching path on the left side of the dirt road. This path crosses the fence of the nature conservation area on ladders and climbes meanderingly onto a hill in the forest. After a few minutes we reach the weekend houses again, turn onto a dirt road and walk about 300 steps on it. The leave the road and choose a path leading into the forest. We follow this winding trail and reach a lookout point after a little while. We have a nice panorama towards the reservoir and its surroundings. If we continue the hike on the path, we reach after a few minutes the end of the ridge and descend steeply among the pine tree until a foot of the hill. We turn left here, and walk till the asphalt road. We turn onto this asphalt trip and reach the car park of the nature reservation area after a five minutes long walk. We meet again with the Gaja Stream here (Gaja-patak Brook), which we saw already a few days ago! This stream fills the big water reservoir, as well! We enter the park through the gate at the far end of the car park and continue our walk on a wide, gravelled promenade. We reach the valley soon, cross the Gaja on a wooden bridge, our promenade runs always in the vicinity of the Gaja. There is a big silence on the bottom of the valley, we can hear only the gurgle sound of the Gaja. Unfortunately we will reach the other end of the valley after a half an hour long walk at the building of Varjúvár (it is an old forest school), and we have to climb out from this nice valley on a steeply rising path. We begin the mountaineering behind the building, cross the fence and climb the hill on a meandering path. There is a branching path towards a lookout point, it is marked with signs, it is worth taking a short detour and admire the panorama of the valley of Gaja from the hillside! After a quarter hour long climb and a few fences we reach the ridge of the hill and the start of the ski slope towards Bodajk village. A very beautiful panorama opens from the top of the grassy slope towards the wide Móri-árok (Valley of Mór), the tree-covered side of Vértes Mountains and the village. We will continue our hike along the route of the Blue Trail in the Vértes Mountains! But first we have to descend on the ski slope into the village, look for the Fenyő Büfé (Fenyő Pub) in the center at the junction of the asphalt roads and stamp into our Blue Trail booklet. The box of the stamp is located in the pub beside the door. If the pub is closed, we will find another stamp at the railway stop of the village, which lies beside the asphalt access road of the village, on the route of the Blue Trail (Bodajk village, railway crossing)! With this stamping we finish our long hike through the Bakony Mountains!